An ad hoc committee will provide an evidence-based analysis of the complex findings in the research on birth settings, focusing particularly on health outcomes experienced by sub-populations of women. It will bring together key stakeholders in a public workshop to further inform this analysis, including representatives from government, academia, healthcare provider organizations, third party payors, and women’s health organizations. The ad hoc committee will explore and analyze the current state of science on the following topics, identifying those questions that cannot be answered given available findings. More than 30 years ago, the Institute of Medicine (IOM) and the National Research Council (NRC) convened a committee to determine methodologies and research needed to evaluate childbirth settings in the United States. The committee members reported their findings and recommendations in a consensus report, Research Issues in the Assessment of Birth Settings (IOM and NRC, 1982). 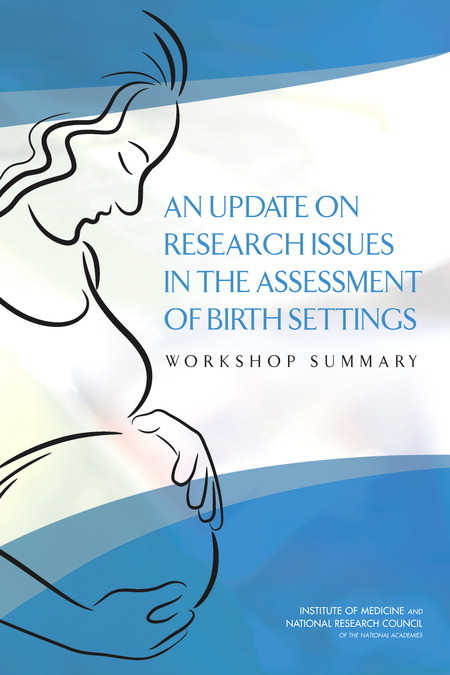 An Update on Research Issues in the Assessment of Birth Settings is the summary of a workshop convened in March, 2013, to review updates to the 1982 report. Health care providers, researchers, government officials, and other experts from midwifery, nursing, obstetric medicine, neonatal medicine, public health, social science, and related fields presented and discussed research findings that advance our understanding of the effects of maternal care services in different birth settings on labor, clinical and other birth procedures, and birth outcomes. These settings include conventional hospital labor and delivery wards, birth centers, and home births. This report identifies datasets and relevant research literature that may inform a future ad hoc consensus study to address these concerns.